Zefiro is an high performance cruiser, the last one in the successful SW100DS mini-series designed by Farr Yacht Design and Nauta Design and she benefitted of the experience gained in the construction of her 8 predecessors. The yacht’s deck saloon configuration offers a protected guest cockpit and an ample deck house saloon with panoramic 270° coachroof windows, which literally bring all-round sea views into the interior. 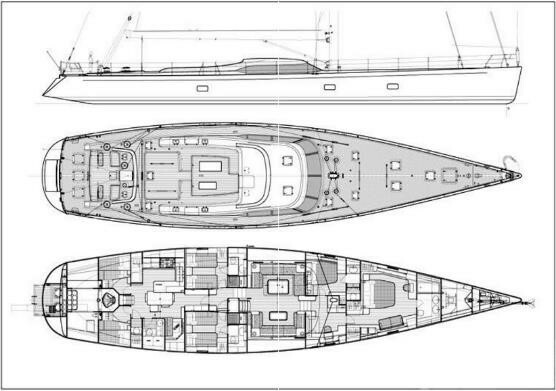 The interior, modelled in typical Italian style, follows the classic SWS layout configuration with an ample owner’s cabin forward, three guest cabins amidships and the crew quarters and galley aft, ensuring privacy onboard. All of the furnishings are built of sturdy, yet lightweight, honeycomb sandwich veneered with natural teak. Zefiro is the perfect expression of Southern Wind yachts’ bluewater soul: besides having sailed all the Oceans since her berth, she took part in some of the most renowned offshore regattas such as the Rolex Sydney Hobart and the New Zealand Millennium Cup.